Backboard Overhand Illustrated at 2 ft. The 30′ 5″ x 25′ 5″ (including edges) Outdoor Sport Basketball Court kit consists of white, custom painted high school standard court lines, perimeter edging and your choice of color combinations to fit your preference. This backyard basketball court is constructed using our tiles in however many colors you’re interested in. Containing loops and pegs, each outdoor water flow tile snaps together to create your entire floor. 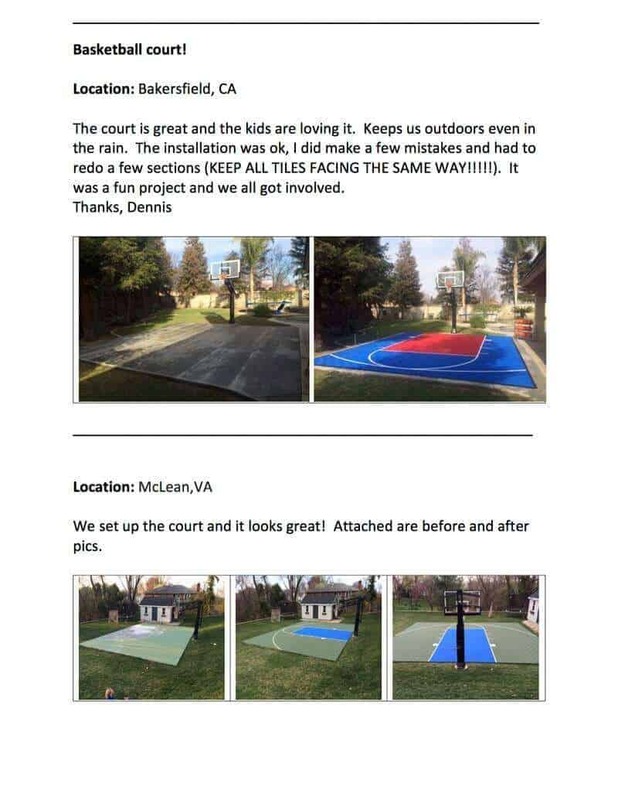 This DIY residential backyard basketball floor kit is easy to install, affordable and the ideal solution for you to obtain the basketball court you’ve always wanted. The Perforated tile used to create this basketball court is manufactured with high-impact polypropylene, making the product rigid, firm, and strong enough to support extreme weights without damaging the material. 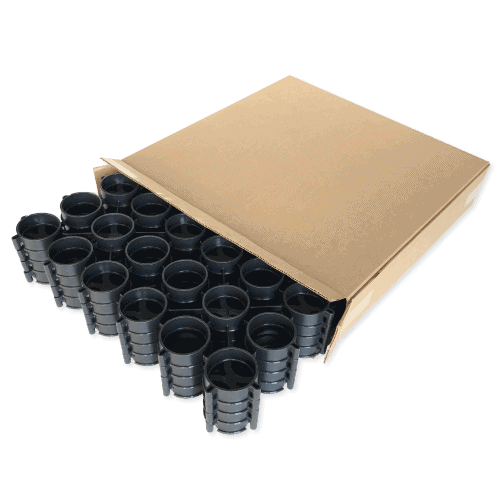 They are also UV stable made for direct sunlight exposure. The basketball court will cover the concrete evenly, despite any small imperfections. The Outdoor Basketball Court Floor is intended to be installed over concrete or other hard surfaces. It is not advised to install this product over grass, mulch, or other soft surfaces. This unique basketball court includes small, elevated features which enhance grip. Because of these special features, extra traction control is provided to prevent slipping while being active on top of the court. The Outdoor Basketball Court’s perforated surface of the individual tiles used to create this product, allows plenty of ventilation for humidity and moisture. Underneath each of these tiles, there also lies a grid structure that provides additional air and water flow. 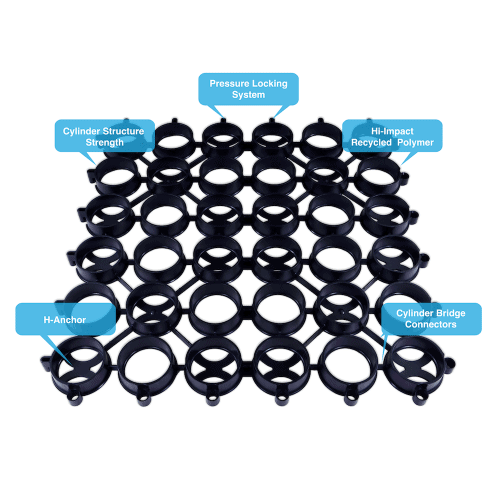 These attributes, along with the mold-resisting polypropylene material, were intentionally engineered to prevent microorganisms from developing on the tile. Our basketball court floor kits are painted based on high-school standards (custom painted by request). 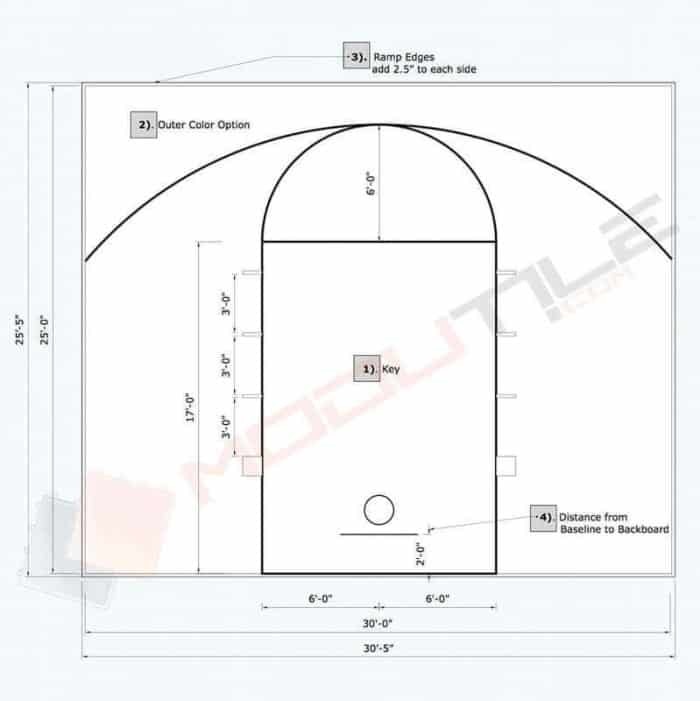 Please see images showing the floor court lines. 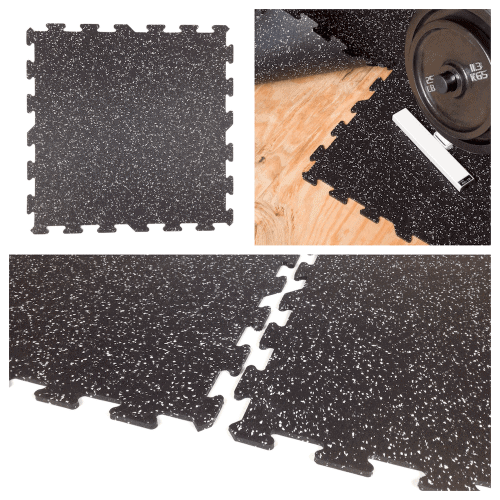 Because the backboard is the main point of reference to where the lines end up, this basketball court floor kit may not be suitable for your particular slab. 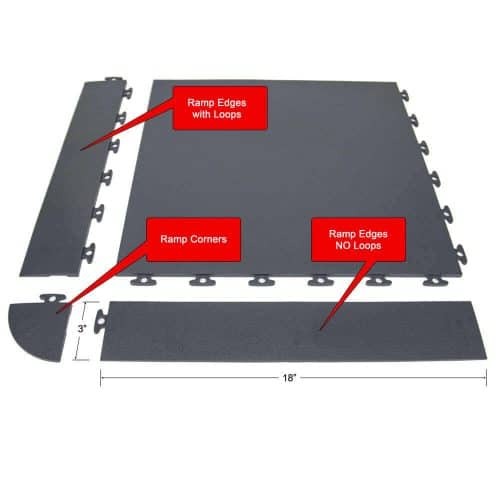 You may need additional tiles to accommodate the size of your concrete slab. The most common issue when deciding how to lay out your floor has to do with the distance from the backboard to the baseline. A standard court would have an additional 4-ft behind the backboard to the baseline. 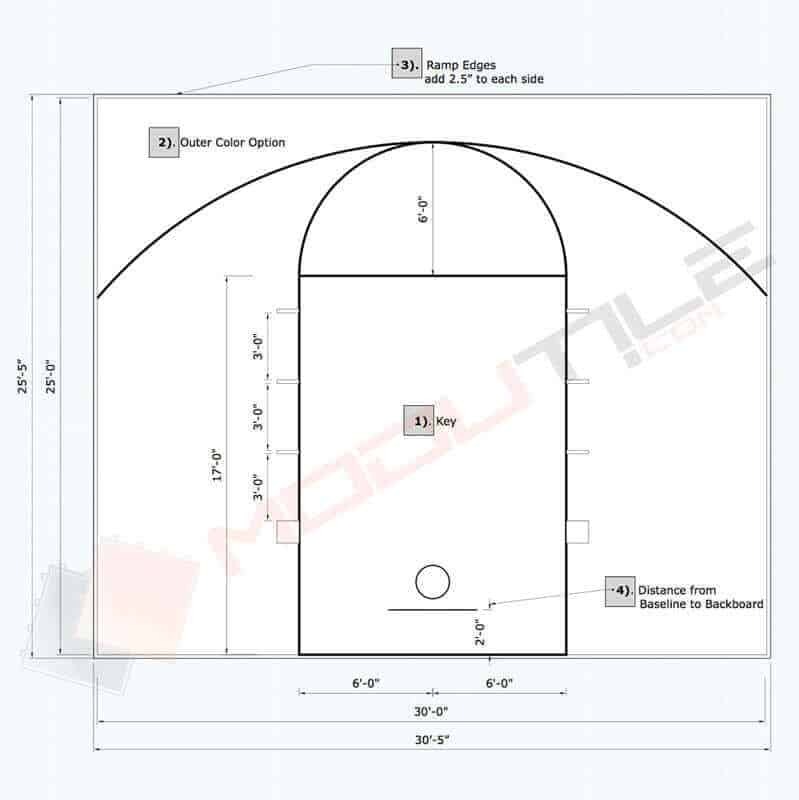 However, because most home basketball court floors do not have the room, this basketball court kit only has 2-ft from baseline to backboard. An additional issue has to do with your baseline dimensions. If the baseline has an odd measurement (ex. 27-ft), please let us know if you would prefer the key to be smaller than standard (11-ft), or whether you prefer to reduce the baseline dimensions by one ft. (ex. 26-ft) in order to center the lines. For small courts, most people will reduce the size of the key. For courts that are larger than 26-ft, leaving a gap at the end of the court is usually a better option. Of course, if we do not have a kit that accommodates the size of your basketball concrete slab, we can custom paint the lines for you. 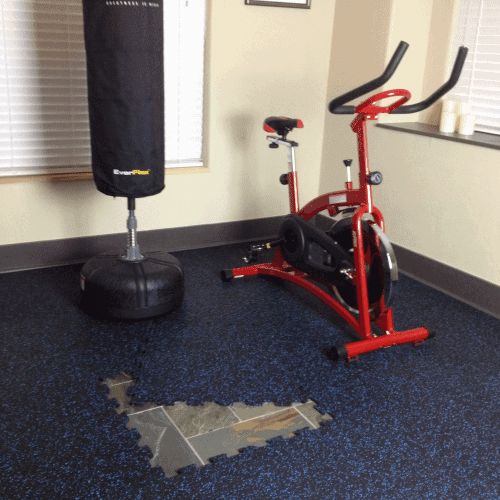 This “Do It Yourself” basketball court floor does not require professional installation. One of the many benefits about the DIY Outdoor Basketball Court is that installation can be done with your own bare hands. Because of the tile’s four Loop-to-Peg Interlocking System, the tiles snap together with a single downward push, very similar to piecing together a puzzle. With installation being so simple, disassembly is also a simple process. TIP: Although not required, you may wish to use a small plastic mallet and knee pads to further ease the installation process. 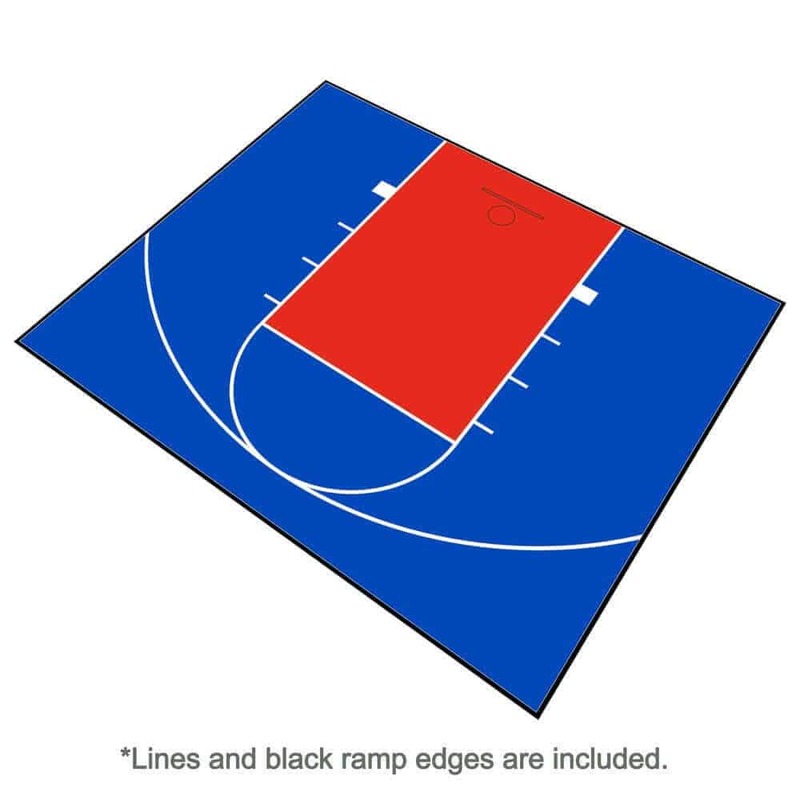 The above Outdoor Basketball Court Floor kits are created to measure 30.5 x 25.5 ft. (including edges & expansion), but options are not limited to just this one dimension. 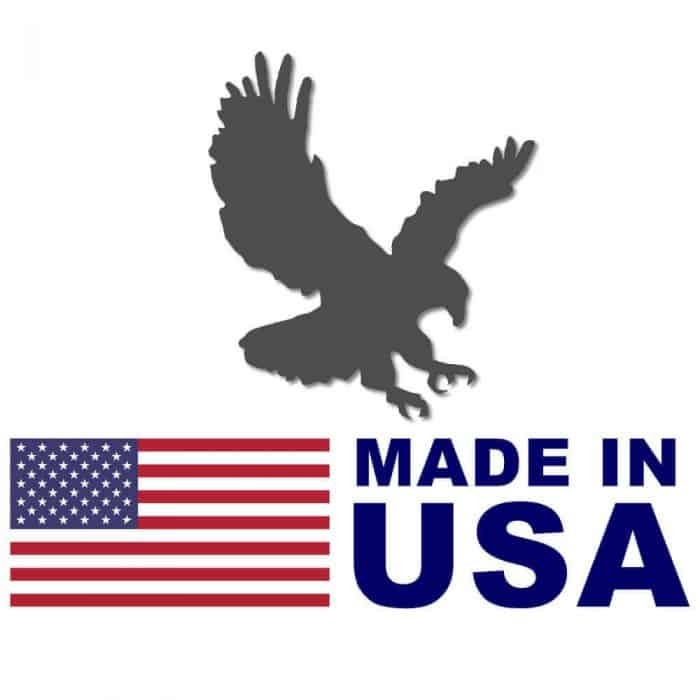 You are welcome to contact us via email or telephone with your custom basketball court size. We can create any custom size with a 3 to 5-day turnaround time. For custom court request, we will need the following information from you. Overall dimensions of the concrete slab. Distance from baseline to the backboard. Preference on odd baseline issue solution: Key to 11-ft or reduced baseline dimension? Please note that the distance from the free throw line is 15-ft from the backboard and the three-point line is 21-ft from the backboard. By request, we can accommodate the lines to fit your concrete slab dimensions and needs. If your concrete slab is large enough, we can also paint the lines based on Mens College NCAA Basketball Court Dimensions. The netted surface of the court leaves small holes for liquid spills to drain down to the base floor and then through the grid structure underneath, making liquids hardly an issue to clean. However, if sticky debris remains on the tile, it is advised to rinse off your court. Unlike an indoor basketball court, the web-like design of the Outdoor Basketball Court Flooring generally requires only one simple type of cleaning method: hosing it down. Clean regularly for the best appearance. 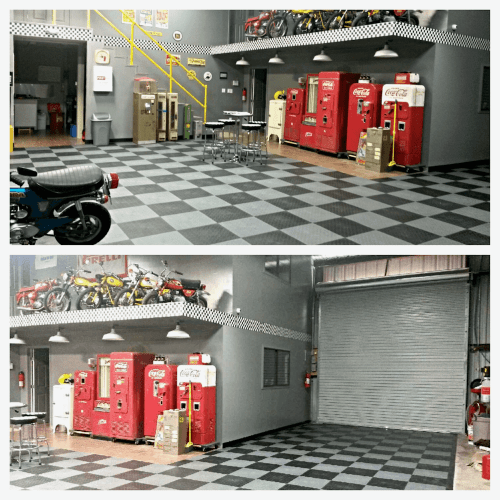 Routine cleaning will enhance the life of the flooring. I’m very happy of how it turned out. P.s. It would be great if you can offer team logos and more color options. The install was easy, especially the way the boxes are so clearly marked. This has truly been one of the best customer service experiences I have ever had. The process was very smooth and shipping was extremely quick. My family and friends love the court and the tiles drastically change the look of your basketball court. It was worth every penny. Two thumbs up and 5 stars for Modutile! 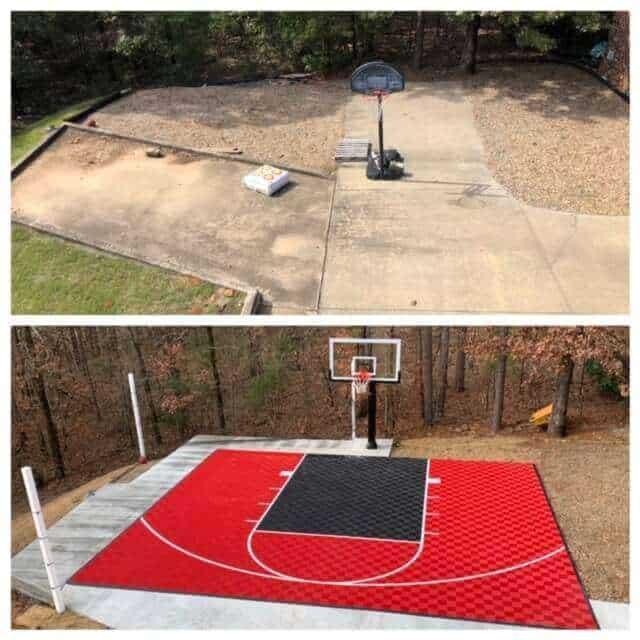 I am so happy with the results of my basketball court it came out amaaaaaazing i love it ! Boxes arrived safe and were easy to handle. The entire process took a few short evening hours for two adults and a couple of kids. One the layout and orientation of the tiles is figured out then the process is pretty much the same for all tiles and is easy to follow since the boxes are packed in order of placement. I would suggest the use of a rubber mallet and gloves. ModuTile is the way to go! 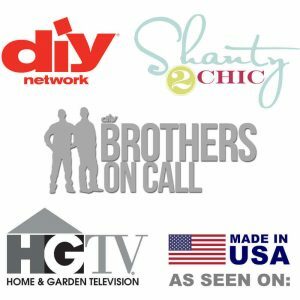 Easy installation, great customer service and quality materials! 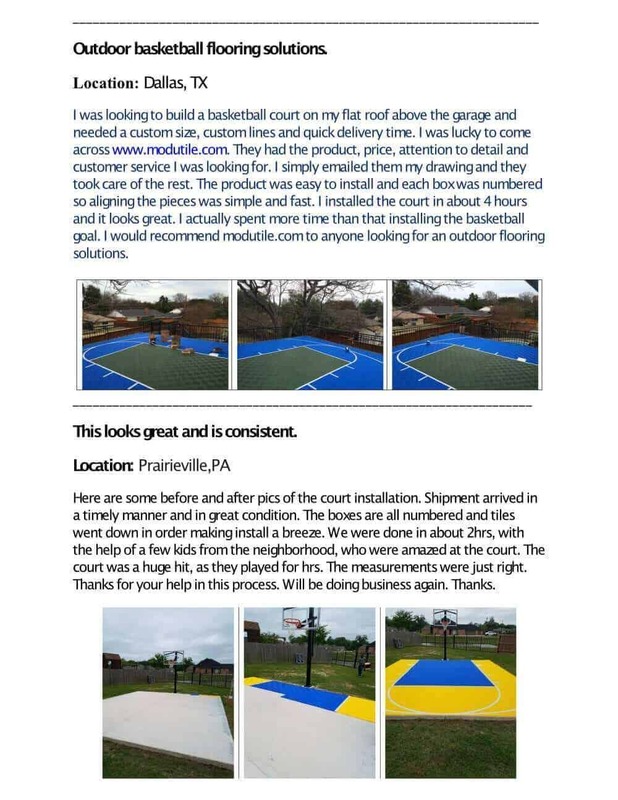 My Husband installed a 23×36 sport court in a few hours. Installation was great pretty straight forward if u read the directions correctly lol … Again thanks for all your help.